Lead track ‘West Virginia’ is a simple ode to a faraway place, presumably as seen through the travelogue of a touring artist. The feeling of surprise at seeing someplace new through storybook imagery really comes across in the lyric despite Moon’s fascination with drowning her natural voice with reverb. Largely constructed of two chords – with an extra one creeping in occasionally – this could be seen as over-simplistic by those who enjoy more flowery arrangements. That said, in terms of the song’s sentiment it really doesn’t require much more. What it lacks in complexity is more than made up for by the inclusion of a guitar break – the tone of the Isley Brothers ‘That Lady’ re-imagined for a garage rock audience. In all, it is a perfect mix of Moon’s styles – the performance has a real spark, but not so much vigour it comes at the expense of the song… A little harder all round, ‘Gave It All I Could’ takes three strong chords and creates an upbeat rockabilly-garage rock hybrid, over which Francie wails and yelps behind a wall of distortion. Although taken at a jaunty pace, the hard bashed snare on its chorus (combined with Moon’s wordless shrieking in places) helps give the impression it that barely lets up. The edgy rhythms and all-round punchiness gives a strong sense of live performance; it may not have the lasting appeal of the slower and more thoughtful tunes, but the level of energy here has to be admired. The garage rock stomp of ‘Rain Coming Down’ provides another very strong example of Francie’s core sound. The acoustic guitars lay down a hefty rhythm underpinned by the simple beat of a snare drum, an equally simple bass fleshes out the arrangement while she delivers every line through a heavy vocal filter. By this point, if you’ve heard any of her prior works, this could feel over-familar, but doesn’t ever suffer for that. The title track is the EPs most sophisticated number, with Moon coming as close to a clean vocal as she ever gets. Her youthful voice is quiet yet possesses a jazzy croakiness that belies her actual years. This unassuming tone is almost swamped by a full sounding arrangement comprising of clean-toned rhythm guitars and a fantastically loud bass part. The essence of the bar-room smokiness shines through everything as Moon tackles something that sounds like Eleni Mandell covering an unheard Tom Waits number from the 1970s. The chorus line “take me to my glass house on the hill” comes dangerously close to being repetitive, but the musical arrangement wins through, resulting in what could be Francie Moon’s finest recording to date. [This really deserves to be released on a 7” via Jack White’s Third Man Records club, perhaps with ‘Rain Coming Down’ on the b-side as a curio]. The sense of retro cool and heavy distortion is as of much importance to the Francie Moon sound on this EP. Her obsession with making things hugely fuzzed out may not appeal to some, but for those looking for a blanket of noise colliding with some retro r’n’r , these songs may just represent listening time well spent. 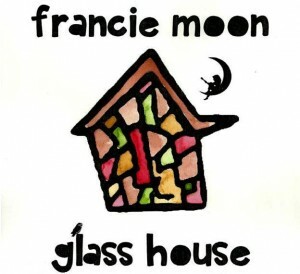 This entry was posted in Album & EP Reviews and tagged francie moon, garage, independent, singer songwriter, stream by Real Gone. Bookmark the permalink.